New national flag adopted at the time of the change of political organisation in 1978, date of the change to the Socialist People's Libyan Arab Jamahiriya. It is used as fin flash. Plain green roundel used with the current libyan national flag. Roundel used between 1969 and 1978. Flag used from 1969, date of the proclamation of the Libyan Arab Republic. It was abandoned in 1978. It has been used as fin flash. 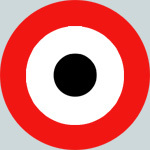 Roundel used from 1951 to 1969. Flag used from the independance, in 1951, to 1969. It was used as a fin flash on the aircraft of the Royal Libyan Air Force. It was identical on both sides of the tail, the crescent being always at the left. © 2002-2006 Roundels of the World - Contact - Updated on 04.12.03, hits.